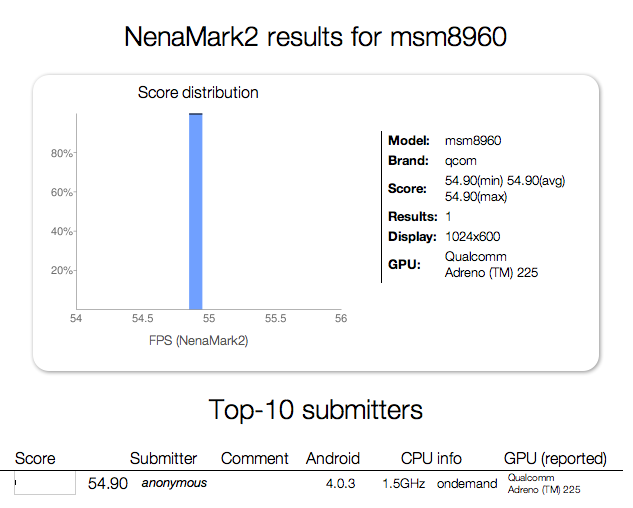 An intriguing NenaMark2 benchmark showed up earlier today, giving us a glimpse of an unknown device packing Qualcomm's 28nm Snapdragon S4 Krait MSM8960 SoC. 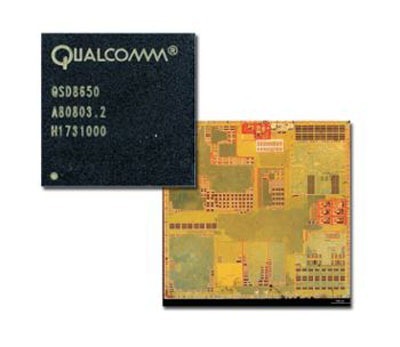 The device has a 1.5GHz CPU, 1024x600 display and an Adreno 225 GPU. Did I mention it's running Android 4.0.3? As you can see, the mystery device's Adreno 225 GPU got an impressive 54.9 fps – a number that's even more astonishing considering the fact that Samsung's Galaxy SII (which has a considerably smaller 800x480 resolution display) scored 46.2 fps with its Mali-400 MP4 GPU. As AnandTech rightly points out, it will be interesting to see how the Adreno 225 compares to upcoming GPUs including the Mali T-604 and Apple's A6 chip. That being said, the Adreno 225 already appears to pack a serious punch, and is worth keeping an eye on as other next-gen GPUs begin to surface.